It’s the special season in Dresden again and numerous Christmas markets invite not only locals but also visitors for a stroll during the Advent season. The traditional Striezelmarkt is one of the oldest Christmas markets in Germany. In addition to it there is also the charming historical market next to the Frauenkirche church. And locals usually do not miss the medieval market at the Royal Stables either. Special festivities like “Pfefferkuchenfest” (Gingerbread Festival) and the Stollenfest are highlights during Dresden’s Christmas season. If you want to have a unique experience in the Advent season, DresdenWalks offers its guests a very special walking tour. On our Christmas walking tour through the historic old town, you will not only see all the famous sights just as on our usual tours but you will also learn a lot of interesting facts about the Christmas traditions in Dresden, Saxony and Germany. 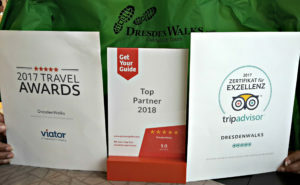 At the end of every tour a small surprise is waiting for each guest … Let us walk with you during this romantic season in Dresden. Our Christmas tours start daily from November 29th to December 24th at 12 noon. Our meeting point is Schlossplatz Square at our green sign. You can book directly via our website with Eventbrite or just come spontaneously to our meeting point. Since our tours have been very popular the last 10 years, we appreciate a reservation or booking for better planning on additional guides to keep the atmosphere of a small to medium-sized group also for this year. Thank you for your help! …or just join our tour and ask your guide!